Creating and maintaining the RotMG wiki is a community endeavor. 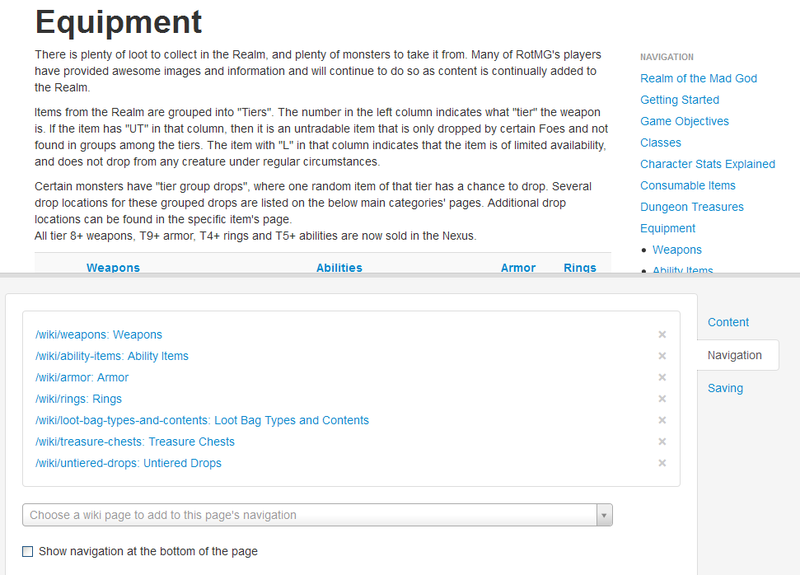 Any RotMG player of at least Rank 14 can edit the wiki. This page provides a technical description about the wiki. Pages are identified by their path. A path starts with /wiki/, followed by lowercase letters (a-z), digits (0-9) and dashes (-). Dashes are only to separate words, so you can’t start or end a path with a dash, and a dash can’t follow another dash. 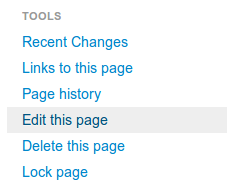 To edit a page that already exists, visit the page and click on the Edit this page link in the tools section. It will only show up, if you have permission to edit the page. Click on the link and the wiki editor will be opened for the path. You can adjust the size of the editor with the gray handle at the middle. The editor itself is split up into three parts. The first one - shown on the picture - is for editing the content. You can edit the title, but best practice is to keep the path and the title consistent. You can’t change the path of a page. The title is plain text, only the body uses the wiki syntax. 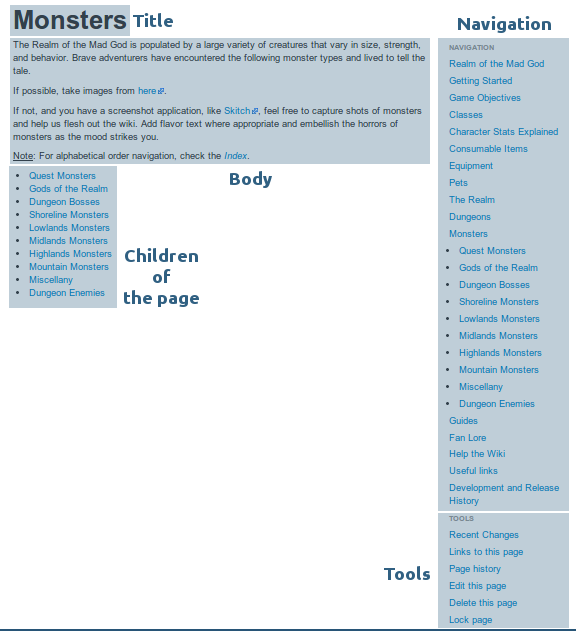 The wiki engine uses Markdown to format the body. Page headers are noted by starting a line with a number of pound signs equivalent to the level of the header. The wiki supports headers of every level from 1 to 6, but typically reserves a level 1 header for the page title. Ex: #Level 1 header, ##Level 2 header, and so on. To create space between lines, you may either insert a single line break with the html tag <br>, or separate paragraphs of text by entering two new lines in the editor. Links may be embedded by surrounding the text to be linked in square brackets and appending the url to be linked within parentheses following the closing bracket. Lists may be ordered or unordered, the former appearing with a number, period and space preceding the text, and the latter with a hyphen - and a space preceding the text. Text which represents code or code-style variables can be surrounded by backticks ` to style them as such. Blocks of code (formulas and multi-line code, for example) can be created by adding four spaces to each line. Such text will *not* display **any** other Markdown features, and will be plain text. Block quotes can be made by prefacing each line of marked-up text with > . Text within quotes can use other Markdown features as well. Images may be embedded using a similar format to links — create a Markdown url which uses the text of the link to describe the image’s content and links directly to the image itself, and precede it with an exclamation point. As of January 27, 2014, the wiki supports a number of Markdown Extra features, namely fenced code blocks, tables, definition lists, footnotes, smartypants, newlines, strikethrough, and special attributes. While very useful for reducing the size of some wiki articles, most of these features will not be necessary on a regular basis. If you’d like to know more about any of them, follow its link and read some of the examples. external link. Any link not pointing to a wiki page. If you want to link to a wiki page, always use relative links. e.g: [Swords](/wiki/swords) instead of [Swords](https://www.realmeye.com/wiki/swords). You can’t upload new images to the wiki, use imgur to host them. Adding navigation will add listed pages as children of the current page, displaying them as bulleted links in the navigation sidebar, and optionally displaying them as a list of links at the bottom of the page. To add additional children to a given page, it must first already be linked in the navigation, whether it be a child of the navigation root, or a child of another visible page. Selecting and typing in the input field will perform a search of the wiki for pages with the searched text. Once chosen, the navigation children may be reordered by dragging and dropping the lines for their entries, and may be removed by clicking on the ‘x’ in line with the given entry. When you’ve finished editing a wiki page, the Saving tab will submit the saved changes with a required comment which should describe the nature and reason for the edit. Do note that sometimes if the coding you added to a page is incorrect, you will not be able to save. (Also occurs if a navigation edit conflicts with the navigation in another page). Use markdown instead of html if possible. RealmEye uses html5, so don’t use self closing tags. Only use <br> for new lines within HTML (usually tables), and use <hr> instead of triple hyphens or asterisks to create horizontal rules. Use horizontal rules to separate parts of the content, instead of empty tables and whatnot. Keep the title consistent with the path if possible. This makes linking much easier. Always link to wiki pages with their path (/wiki/page-name). When adding images or external links, use https://sitename.com instead of http://sitename.com whenever possible. This will allow users browsing the wiki securely to avoid having traffic over both http and https. What should I change on the wiki? In addition, the Help the Wiki page is regularly updated with current lists of pages which need updates, so when in doubt, start there. Where can I see changes and history of the wiki? A list of all of the most recent edits to any wiki page within the last 24 hours can be found on the Recent Changes of the RotMG Wiki page. Additionally, any page which can be edited retains a history of all edits made to the page, which can be found by clicking on the Page History link in the Tools section while on that page, or by visiting /history-of-wiki-page/<page name> for the given wiki page. What does this rounded arrow symbol mean? This rounded arrow symbol is shown in the right-most column of the history of any page which was reverted to an earlier revision. Hovering over the symbol will name the version which was reverted to, and clicking on the symbol will link to the page as it appeared in that version. What does this lock symbol mean? This lock symbol is shown to the top-right of any locked page and in the right-most column of the history of any page which was locked or edited while locked. Locked pages may not be edited or reverted in any way except by wiki moderators. If you feel a locked page needs to be edited, send a message to a wiki moderator regarding a need for such a change. I want to practice coding. Is there a place where I can? You can experiment with coding and play around with it in the sandbox. Have fun playing with the code!